This mount has two fully ball-raced bearings capable of supporting instruments of up to 13kg in weight (manufacturer specifications). Photographic and autoguiding capacity of this mount will be effectively one half to two thirds of this figure, depending on the configuration of the telescope in question. Polar alignment is easy with the built-in variable illumination polar alignment scope with reticule and asterism guide (for both Northern and Southern hemispheres), enabling precise polar offset. Instruments and cameras can be mounted directly to the mount via standard Vixen/Synta-profile dovetail bar. An knurled attachment bolt and additional locking thread is provided to make sure your scope stays put throughout visual observation and imaging, but can also be easily detached or re-balanced when needed. The Bresser Messier Exos 2 Goto is powered by an included 12v battery pack, which takes non-rechargeable D-cell batteries (not included). However, the mount can be powered by a conventional Powertank or other rechargeable 12v system, or can be run off a 240v mains supply using the Revelation Meade-compatible 12v DC converter (BC169). 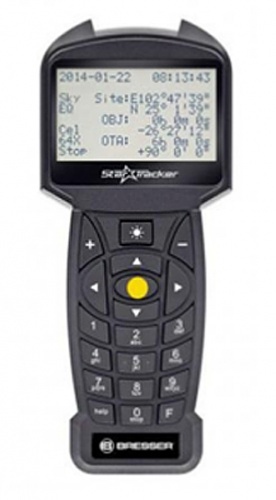 The Goto system of the Besser Exos 2 Goto is controlled through teh new StarTracker handset with large LCD display, containing a 30,000+ object database. Extra features including guided tours with satellite, comet and asteroid tracking. The mount features an ST-4 autoguiding port for direct autoguiding camera connection via the standard ST-4 protocol. The Exos 2 Goto will also be able to be controlled by a remote computer with a forthcoming control cable - delivery date TBC. 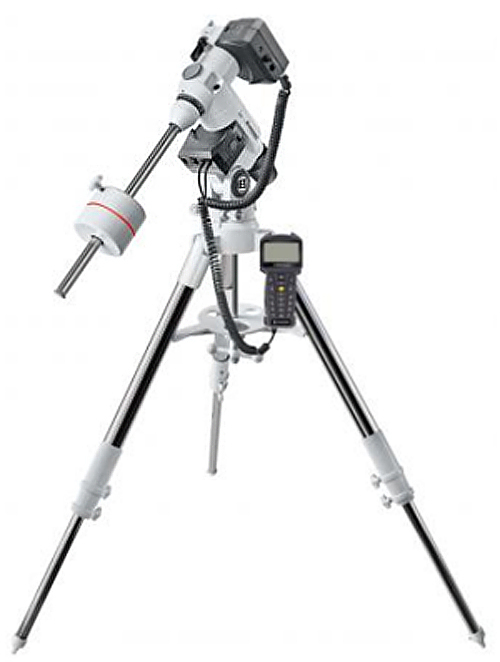 A sturdily constructed, finely finished, variable-height field tripod with spreader bar brace provides the stability and vibration damping required for visual observation and astrophotography. This leg brace also doubles as an accessory tray, with cutouts for eyepieces and accessories which can be easily identified in the dark. The whole mount is easy to set up and take down again after an evening's viewing, and can either be kept together for transport, or alternatively broken down into easily-managed separate parts.